This workout is designed to let you use your own bodyweight as resistance. I’ve included videos of the moves below so that you can see proper form. I suggest 30-45 seconds rest between exercises…but rest more if you need to. Break up the moves and modify the moves if you need to. For example, if you can’t do 10 pushups in a row, do 2 sets of 5. 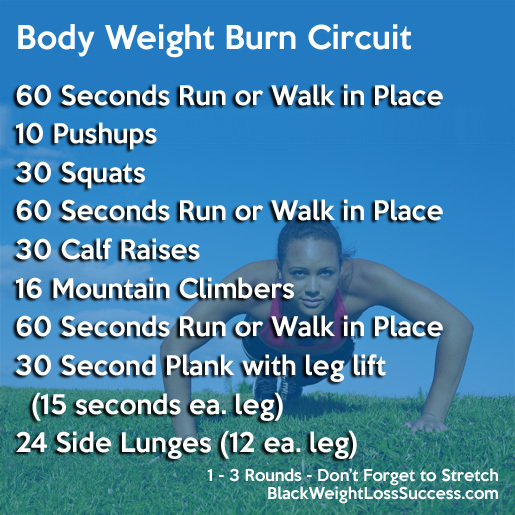 This is a circuit workout, so you can do one round or repeat several times (2-3) to make it a full workout or just add one round to your normal workout. Do this circuit at your own pace and avoid any moves that would irritate old injuries. * Don’t attempt if you are pregnant or have recently had surgery.